I am always on the hunt for a healthy breakfast or snack that my kids will find tasty and that I will find healthy! Well, this one is a winner!!! Relatively easy to prepare and super delicious!! Preheat oven to 350°. Line with paper liners a 12-cup cupcake pan. In a large bowl, sift together the flour, cinnamon, baking soda and salt, then whisk in the hemp, flax and chia seeds. In the bowl of a stand mixer fitted with the paddle attachment, beat the bananas, both sugars, oil and eggs. Add the flour mixture to the banana mixture in two additions, beating until blended after each addition. 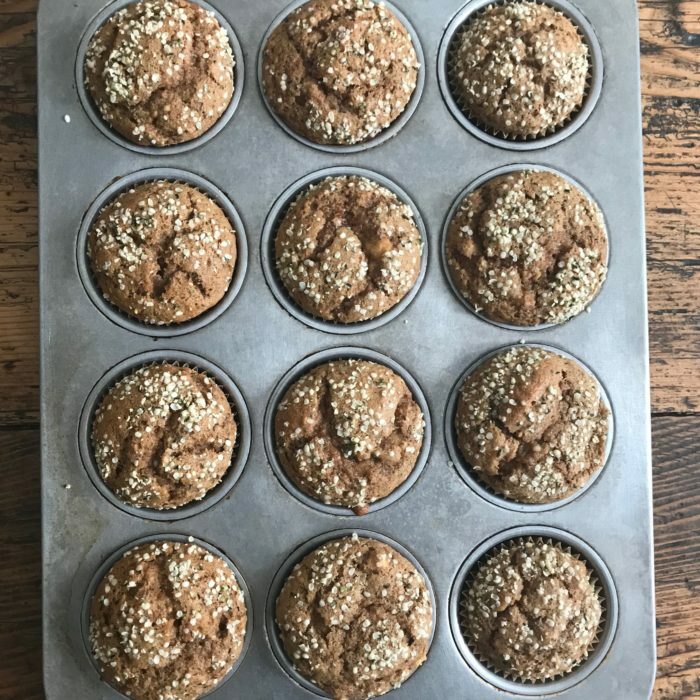 Scoop the batter among in the muffin tin and sprinkle each muffin generously with 1 teaspoon of hemp hearts. Bake until golden brown and a toothpick inserted into the center comes out clean, 18 to 20 minutes. Transfer the pan to a wire rack and cool completely.